Personalized iPad Pro Cases, iPad AIR Photo Case, Personalized iPad AIR Photo Case and more. Easy to Use Templates. Read how my Custom iPad Air Case SAVED my iPAD AIR tablet, TWICE. CALL Designer Linda: 239-949-9090 to Design Your iPad Pro Photo Case or other designs on the Latest and Greatest iPad Cases, Phone case and more. Amazingly Clear Vibrant Printing from the Best Print on Demand. Two Photo and If you see one of my Designs that you would like changes to or to have a similar design placed on a different Zazzle product. I can also place your Photographs for you, Add Text etc at no extra cost. You will get to see your product prior to deciding to purchase it with No Obligation and No Minimum orders. BULK Discounts too. I am usually a really careful person and I take excellent care of my products but I had two different experiences with dropping my iPad. I I did not have this fabulous iPad AIR Photo Case. I believe my iPad Air been shattered. Here is what happened. I had my 3 week old iPad Air open, as I was working, Pinning Pinterest Pins. My mom suddenly tripped on a rug as she was coming in from outside. I quickly stood up, to try to catch my mom, but she was too far from me to grab, my iPad Air fell FLAT on it’s FACE. I didn’t even know it or think about my new iPad Air, all I could think about was my mom. After everything settled down, I saw my iPad Air laying on the floor, face down. I picked it up, looked at it, and everything seemed fine. I could not see a scratch or any problem whatsoever. Update: My iPad works perfectly for years. The next incident happened when I was putting my iPad Air down on the table and it slipped through my hands and fell on the floor again. This time the Custom iPad Air Case was closed giving it even more protection. I knew it would be fine because it survived that other bad forceful, fall. I am so grateful that I bought this Case for iPad Air. I designed my case with a couple of my favorite designs my mother and I created for my Zazzle gifts. I get so many compliments and for me this opens up an opportunity to tell them about how fantastic Zazzle Personalizable Gifts are. With the easy to use Templates for YOUR PHOTOS and YOUR TEXT it is fun to Make Your Own iPad AIR Cases. My best selling iPad Air Case is the first Custom iPad Air Cover. You can ADD Two Pictures. One needs to be a Vertical unless you totally Delete the TEXT and Banner and the other can be a VERTICAL or HORIZONTAL. It will be so much fun to show off your favorite pictures with the Best Print on Demand Company, Zazzle. Their Crystal Clear Printing is Second to NONE and the New iPad AIR Cases are brand name. How to Make Your Photo iPad Air Cases. To Upload YOUR PICTURES, on the product page. Click on the little Button “Change” by my temporary images. Follow the prompts to “Upload New Images” and or “Select Images to Upload”, choose YOUR PHOTO. Type in YOUR TEXT or NAMES in the Text Box(es), when available. CALL Designer Little Linda Pinda to create your device cases for iPads, Tablets and many Phone styles. Impressive Less than 1% Return Rate. or One of each. Any Direction works with this case. Carefully Proportioned for 6 x 4 inch or 4 x 6 inch Proportioned Images. Most of the Photo Template section are carefully proportioned for 6 X 4 inch photographs except the Square and the Round Photographs. I suggest that you Crop those Two Photos into Squares to fit best. The images are set to fill the entire template space. I will be more than happy to place the photos for you and you will see it before you buy it or not. No obligation. Have fun choosing your favorite photos. Collage iPad Cases are great for Grandparents and Parents who want to include lots of photos. Be sure to read above how this Personalized iPad Air Case SAVED my iPad Air that was less than 3 months old. Not a scratch and no internal problems. With the nice rubber edge, you can type on the Customizable iPad Air Case while standing it up on a desk or table. Protective iPad Air Case, to say the least. Mine fell flat onto it’s face and is still in Perfect shape. See my story above. Hard DODO Case with YOUR PHOTO and TEXT on the Inside of this case with durable Morracan Cloth covering the outside in several color choices. Click the CONTACT for HELP for SPECIAL ORDERS or Design Changes. I can place ANY of my Designs on ANY Zazzle Product. [email protected] Please Write “CONTACT LINDA for HELP” in the Subject Line. Photo iPad AIR Cases for your New iPad AIR. Custom iPad Air Covers with Two Photos and YOUR TEXT too. Personalized iPad Cover Photo with YOUR IMAGES. 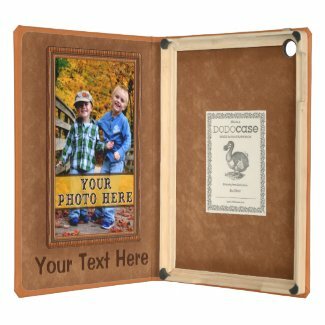 Grandmas and Grandpas will love seeing all of their grandchildren on an iPad Photo Cover Case. Make it extra special. Contact Linda at 239-949-9090 if you need any help or would like me to put any of my original designs on any product. I can place your photos and or text for you too. No extra costs and no obligation to buy it. You will see the product before you buy it.